Occasional sparks of wisdom were visible in the Muslim societies but they were soon overtaken by the ‘secular darkness’ viciously spreading in the Muslim lands in the wake of colonialism. 1qbal’s following couplet now looks poignant: Tāza phir dānish‑e‑ḥāïir ney kiyā wo siḥr‑i‑qadīm. Guzar is ‘ehd mēn mumkin nahīn be chūb‑i‑Kalīm Modern knowledge has revived the ancient magic of Pharaoh. No one can pass through this age without the staff of Moses. Muslim civilization in the present times looks like a tree, withering fast, losing sap, leaf‑less and fruitless, ready to die or about to be cut down for others’ fuel. But lo! All of a sudden a robust and sturdy shoot sprouts from the trunk. The tree lives and the forebodings die. This new symbol of the invigorated Muslim life is none other than the formidable Al‑Attas. And Wan Mohd Nor Wan Daud has done a great service to the Muslims in general by writing this book. Their selves are replicas of falsehood and they span out into all walks of Muslim life, thus aggravating the confusion even further. This vicious coterie of false leaders sets up a macabre play of musical chairs, while the Muslim peoples look on befuddled and bamboozled. In other words, apparent Muslim failure is merely an exteriorisation of a deep‑seated failure which is spiritual and epistemological. Dr. Daud fully elaborates Al‑Attas’ seminal contributions to the religious thoughts and their bearing on the modern Muslim education. Following the tradition of the higher Sufis, Al‑Attas delineates the contours of Islamic metaphysics and world‑view of Islam. His metaphysics is rooted in the Islamic fundamentals as set forth in the Qur’an and the Sunnah. Once we get this philosopher’s stone, everything is transmuted. Eyes begin to see and hearts begin to hope. The magical dazzle of the modern secularism and its technological achievements begins to flicker off and we see things in proper perspective. This is adab which is a blessing of proper worldview of Islam. The man of adab is central to the whole Islamic scheme of things. And adab means: recognizing and acknowledging the right and proper places of things, the acquisition of good qualities and attributes as well as actions to discipline the mind and soul, and the avoidance of erroneous actions. Adab is built on knowledge, proper methods of knowing and ḥikmah (wisdom) leading to ‘adl (justice). The book dwells long at Al‑Attas’ most sustained and in‑depth critique of the modern West and its conception of reality. His ideas bring into sharp relief the “the fundamental elements, characteristic of the Western spirit and worldview, that are antithetical to Islam, namely the dualistic view of reality, the secular ideology, the humanistic philosophy and the tragic conception of life”. These elements are worked into the modern humanistic education at universities through literary classics and secular science and philosophy. The modern university suffers from the absence of epistemological authority and the normative ‘character’. The ideals and aims of modern education are always in flux and trapped in a Sisyphean process of becoming. Authority in Muslim education is predicated on the divine guidance and the Absolute Truth of the Holy Qur’an. The presence of the Holy Prophet at the heart of the Muslim education saves it from the meaninglessness of modern becoming and sets up a model before individuals to emulate and achieve. Islamization of modern knowledge is the natural consequence of Al‑Attas’ Islamic metaphysics. Even at the risk of plagiarism and simplification, a real danger to Al‑Attas’ preternatural ideas, one cannot help saying that Islamization essentially means bringing the farḍ kifāyah knowledge UNDER the purview of the farḍ ‘ayn knowledge. This is what Islamic adab demands and this is what leads to Islamic adab. As soon as the divine touches the mundane, its secular crookedness straightens and its profanity is sanctified. Hierarchical view of reality is central to the whole project of Islamization. 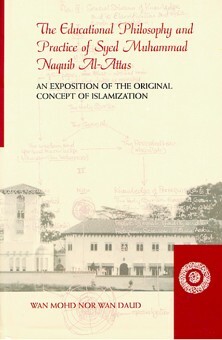 Al‑Attas’ perspective on the role of language in the process of Islamization in the early Islamic history and its role in de-Islamization and secularisation of the Muslims in the modern times is an intellectual tour de force. His efforts to rediscover the original definitions of the key terms of Muslim discourse and his resistance to their semantic erosion have greatly strengthened his argument for the Islamization project. If a human being can be ‘Islamised’, so can all his endeavours be. Knowledge, as Dr. Daud shows in the light of his mentor’s ideas, is an attribute of man. Once modern secular knowledge is plugged into the grid of farḍ ‘ayn knowledge, it will be divinely ‘enlightened’. The author makes a convincing case for a radical transformation of Muslim university education, incorporating the ideas of Al‑Attas which have universal relevance. He enumerates all the efforts undertaken in the major Muslim lands in response to the colonial education and the challenge of the modern knowledge and exposes their inadequacy. Interestingly, the author does not mention Jami‘ah Usmāniah, Hyderabad Deccan, where the medium of instruction was Urdu and which produced internationally recognized scholars representing true Muslim character. The Jami‘ah was a glorious effort, begun with great difficulty under the interfering English nose. Pakistan is now paying the wages for its forgetfulness of such a successful venture. The stress to transform the higher education is understandable. It is the higher education in the Muslim lands that has brought us low and it is where we traded our dignity for trivial and ephemeral things. Unfortunately, it seems like most online bookstores are out of stock. I would try online stores based in Malaysia if you can find any. I personally have a copy but don’t remember where I purchased it from. In case you are still looking for this book, please let me know. I am a student at the institution. It should be still available. if you are interested please let me know thanks. I too am interested in a copy of this book. Let me know what are the steps to follow to acquire a copy. Please tell me how I can get a copy too. I live in Singapore. Jazaaka’Llahu khayr. I am looking for most of his books including this. Could you please let me know where I can find them online. I stay in London. Shall wait for ur reply. I am looking all over for this book. Where can it be found? it’s amusing that one might put esposito down as an editor of the book. it was shifa, al-attas’ daughter, who edited it. singaporeans might still be able to find the book at wardah? Thank you in advance for your help, selams! I would also like a copy if anyone does have it. I still don’t understand why Sayyid al Attas continues to be underrated in the Muslim world, when he is actually from the greatest Islamic intellectuals of modern era standing firm upon traditional orthodoxy. His work should be translated to every language used by Muslims, or made easily accessible to every Muslim intellectual. Yet instead, its quite difficult to get hold of it. Most of the Muslim world is struggling with clash with modern world and Al Attas has done such a great work to cure the evils of modern world and shed light upon this mirage of modern world. His work should be a must read for Muslim scholarship and colleges and made part of the syllabus. People in Malaysia should obtain more advises, teachings and interviews from his blessed oceanic knowledge and make it accessible to rest of the Muslim world and preserve it for benefit of Muslims to come. We are living at the time where such scholars continue to decrease and are taken away from the Ummah. His outward simplicity is a reflection of the wisdom he is blessed with. May Allah taala grant him longevity and bless us through him.